Set of 20 Girlboss vector patterns with feminine color palette. 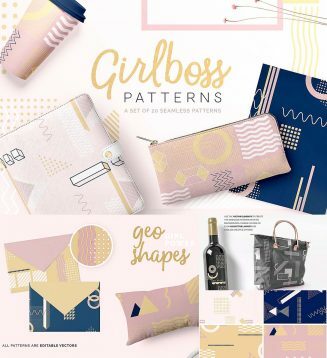 You can select and use them separately if you like or even create your own unique patterns by mixing the geometric elements of this set! Tags: abstact, branding, digital paper, feminine, girly, line, pattern, pink, vector pattern.